Thursday January 4th 1894 I ironed and did up my work before Mother got over. I had dinner in good time. I fixed the loops on Mothers cloak in the afternoon and then we went down to Mrs Lathrops and to the depot of an errand. She sent home in the buggy with Edith. I went up town for some things. weather cold. Spent the evening at home working on mat. Friday January 5th 1894 Will and I were ready to start to Aunt Ems by half past nine oclock. Went past Hedges to see about chickens. We had a pleasant visit, did not get home till nearly night. Spent the evening talking with Mrs Bivens. weather quite cold. This is Mothers birthday. 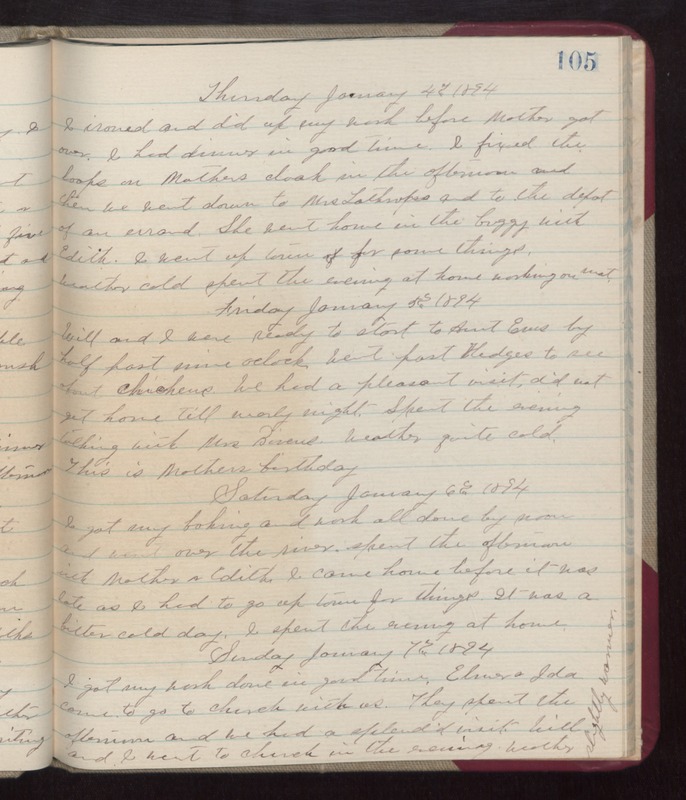 Saturday January 6th 1894 I got my baking and work all done by noon and went over the river. Spent the afternoon with Mother & Edith. I came home before it was late as I had to go up town for things. It was a bitter cold day. I spent the evening at home. Sunday January 7th 1894 I got my work done in good time. Elmer & Ida came to go to church with us. They spent the afternoon and we had a splendid visit. Will and I went to church in the evening. weather slightly warmer.